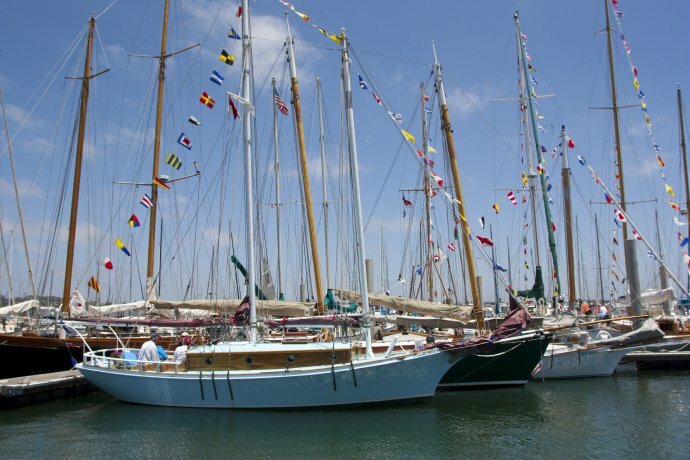 A San Diego Father’s Day weekend tradition, the San Diego Wooden Boat festival is the premier annual event for Southern California wooden boat enthusiasts and provides a rare opportunity for the general public to view some of the most beautiful and well maintained wooden crafts up close. While this event features mostly well preserved vintage vessels there are also plenty of new crafts that have been hand crafted with skill and meticulous detail. The event is sponsored by Koehler Kraft Boat Yard and is held at the Koehler Kraft Facility and adjoining marina. It began in 1990 as a tribute to Clarence Koehler Sr. who passed away in 1986. Clarence Koehler Sr. founded Koehler Kraft (formerly Mercury Marine) in 1938 as a builder of a popular line of mahogany sport fishing boats and racing runabouts. He moved the operation to its current Shelter Island location in 1952. The weekend festivities include live music, a galley generously run by members of the Koehler Family along with a few dedicated volunteers, a variety of booths, activities for children, and a raffle with a large assortment of valuable items donated from local businesses. The popularity of the event has lead Koehler Kraft to use the proceeds to benefit local charities. Food and refreshments are available for an additional cost. Visit www.sdwoodenboatfestival.org for more information or to apply to be an exhibitor.